The Second Judicial District Commission on Judicial Performance, on a vote of 10-0, recommends that Judge Martin F. Egelhoff BE RETAINED. The governor appointed Judge Egelhoff to the Denver District Court bench in July 1999. He earned an undergraduate degree at Colorado State University in 1981 and a law degree at the University of Colorado School of Law in 1984. Before becoming a judge, Judge Egelhoff served as Chief Deputy Denver District Attorney. Judge Egelhoff engages in legal and non-legal community service activities. During the current period, Judge Egelhoff has presided over civil and criminal courts. He currently presides over criminal matters. The Commission reviewed the results of surveys of lawyers and non-lawyers, interviewed the judge, reviewed three of the Judge’s written opinions and an appellate opinion reviewing one of his decisions, and selected members of the Commission observed Judge Egelhoff in court. Of attorneys responding to the survey, 70% recommended retention, 18% recommended against retention, and 11% expressed no opinion. Of non-attorneys responding to the survey, 91% recommended retention, 4% recommended against retention, and 6% expressed no opinion. Judge Egelhoff’s survey results revealed an overall combined average rating below the average combined rating of all judges standing for retention. During Judge Egelhoff’s interview, the Commission discussed with the Judge the Commission’s concerns that attorney survey respondents rated Judge Egelhoff’s performance below-average and particularly that the survey showed significant negative ratings and comments related to Judge Egelhoff’s overall demeanor. 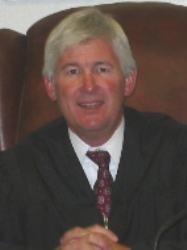 Judge Egelhoff expressed concern regarding attorney survey results showing he was below average in giving proceedings a sense of dignity, treating participants with respect, and conducting the courtroom in a neutral manner, and with the negative comments regarding his impatience, shortness of temper, and apparent arrogance. Judge Egelhoff indicated his willingness to work on these issues and perceptions. The Commission notes that Judge Egelhoff did not receive the same level of negative survey results or comments from non-attorney respondents. During the current term, Judge Egelhoff impressed the Commission with his ability to take over and manage difficult courtroom dockets, when the judges rotated courtrooms. Judge Egelhoff has twice received difficult courtroom dockets and his efforts to put case management back on track may be the root of some of the negative criticism. Positive comments described Judge Egelhoff as being thoughtful, knowledgeable about the law and patient with his explanation of rulings.